Patrick Brady was born on October 1, 1936, in Philip, South Dakota. He was commissioned a 2d Lt in the Medical Service Corps through the Army ROTC program at Seattle University on March 20, 1959, and went on active duty beginning April 4, 1959. After completing the Army Medical Service School at Fort Sam Houston, Texas, Lt Brady served with the 3rd Battle Group of the 6th Infantry Regiment in Berlin from September 1959 to August 1961, followed by service as commander of the hospital company in the 279th Station Hospital in Berlin from August 1961 to October 1962. He attended U.S. Army Intelligence School at Fort Holabird, Maryland, from October 1962 to March 1963, and then completed U.S. Army Helicopter School at Camp Walters, Texas, and Fort Rucker, Alabama, from March to December 1963. Capt Brady then deployed to Vietnam, where he served as a Dust Off pilot with the 57th Medical Detachment-Helicopter Ambulance (HA) from January 1964 to January 1965. His next assignment was with the 11th Medical Battalion of the 11th Air Assault Division at Fort Benning, Georgia, from February to July 1965, and then with the 54th Medical Detachment (HA) at Fort Benning from July 1965 to August 1967. He then deployed to Vietnam with the 54th Medical Detachment from August 1967 to July 1968. 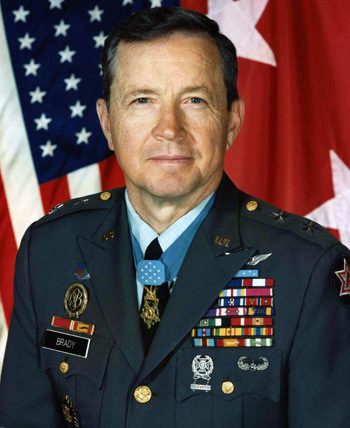 During his two tours as a Dust Off pilot in Vietnam, Brady flew 3,000 combat evacuation flights and rescued more than 5,000 wounded and trapped soldiers and civilians from battlefields, firebases, and ambush sites. Maj Brady served as an instructor with the U.S. Army Medical Field Service School at Fort Sam Houston from July 1968 to July 1970, and then completed his MBA at the University of Notre Dame, Indiana, from August 1970 to May 1972. He served in the Office of the Deputy Chief of Staff for Logistics with Headquarters U.S. Army in the Pentagon from June 1972 to July 1975, followed by Armed Forces Staff College at Norfolk, Virginia, from August 1975 to January 1976. LTC Brady next commanded the 326th Medical Battalion of the 101st Airborne Division at Fort Campbell, Kentucky, from February 1976 to July 1977, and attended Army War College at Carlisle Barracks, Pennsylvania, from July 1977 to June 1978. He worked with the Reserve Components under 6th Army at the Presidio of San Francisco from July 1978 to June 1981, and then served as Secretary to the United Nations Military Armistice Commission coordinating security and negotiations with the North Koreans in the DMZ as part of the U.S. Army Element of the Republic of Korea/U.S. Combined Forces Command in South Korea from July 1981 to July 1983. His next assignment was as Inspector General with I Corps at Fort Lewis, Washington, from July 1983 to June 1985, followed by service as Chief of Staff for Headquarters 1st Army at Fort George C. Meade, Maryland, from June 1985 to September 1987. He then served as Chief of Public Affairs for the U.S. Army in the Pentagon. Gen Brady’s final assignment was as Deputy Commanding General of 6th Army and of the Presidio of San Francisco. He retired from the U.S. Army on September 1, 1993. Major Patrick H. Brady, Medical Service Corps, distinguished himself by conspicuous gallantry and intrepidity while serving with the 54th Medical Detachment, 67th Medical Group, 44th Medical Brigade in the Republic of Vietnam. On 6 January 1968 Major Brady, commanding a UH-1H ambulance helicopter in the vicinity of Chu Lai, volunteered to rescue wounded men from a site in enemy held territory which was reported to be heavily defended and to be blanketed by fog. To reach the site he descended through heavy fog and smoke and hovered slowly along a valley trail, turning his ship sideward to blow away the fog with the backwash from his rotor blades. Despite the unchallenged, close-range enemy fire, he found the dangerously small site, where he successfully landed and evacuated two badly wounded South Vietnamese soldiers. He was then called to another area completely covered by dense fog where American casualties lay only 50 meters from the enemy. Two aircraft had previously been shot down and others had made unsuccessful attempts to reach this site earlier in the day. With unmatched skill and extraordinary courage, Major Brady made four flights to this embattled landing zone and successfully rescued all the wounded. On his third mission of the day Major Brady once again landed at a site surrounded by the enemy. The friendly ground force, pinned down by enemy fire, had been unable to reach and secure the landing zone. Although his aircraft had been badly damaged and his controls partially shot away during his initial entry into this area, he returned minutes later and rescued the remaining injured. Shortly thereafter, obtaining a replacement aircraft, Major Brady was requested to land in an enemy minefield where a platoon of American soldiers was trapped. A mine detonated near his helicopter, wounding two crew members and damaging his ship. In spite of this, he managed to fly six severely injured patients to medical aid. Throughout that day Major Brady utilized three helicopters to evacuate a total of fifty-one seriously wounded men, many of whom would have perished without prompt medial treatment. Major Brady’s conspicuous gallantry was in the highest traditions of the military service and reflects great credit upon himself and the United States Army.